I'll do better ones when it's not so cold out. This baby quilt is made with Sandy Gervais' Snap Pop. I used one Charm Pack and 2 Candy Squares and a lot of Kona Snow! It's a simple block and can be moved around to create different patterns. I trimmed each block to measure 8.5" X 8.5" and used all 42 Charm Squares in a pack so it's a 6 X 7 layout. So the finished size will be 46" X 56". 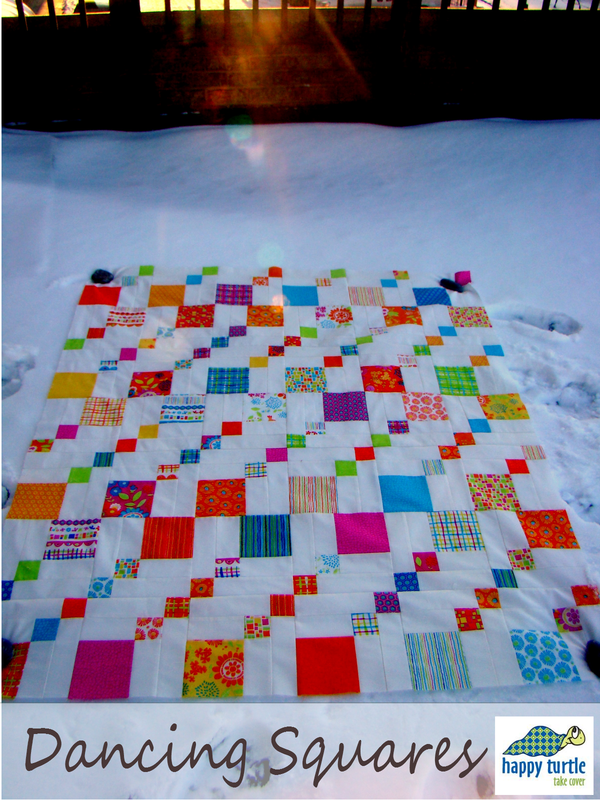 Very cute quilt top-I love bright colors against white. Here's hoping for an early spring! Did you use yardage of Kona Snow or jelly roll? I think I have figured out your pattern. So bright and cheerful for a little one! I know what you mean about taking photos in the cold -- very tricky! So bright and fun! I like the layout you used! What a great block design. It goes together really well. I love the bright colours. Such happy colors - and love the ethereal bokeh effect! I'm enjoying your creativity in the midst of the snow. Wonderful quilt top. Love the title of the pattern! Love how bright and cheery the fabrics are! This is a great pattern, I can definitely see how versatile the block could be! Gosh I love the bright colors against the white! Bright colors just make my heart happy. Great job! Beautiful quilt. I just found it and it is great.